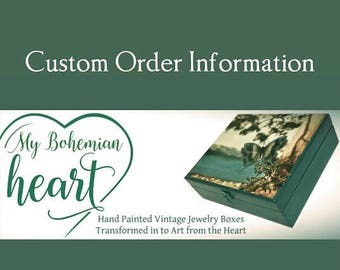 Announcement My Bohemian Heart offers Custom, Personalized, OOAK Quality Hand Painted Vintage Jewelry Boxes for Men and Women. 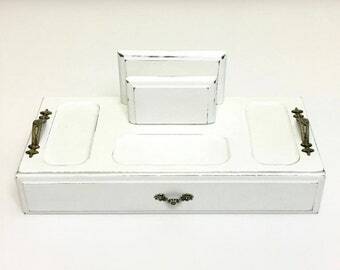 Whether it's an Antique Wooden Jewelry Box, Vintage Mens Valet Box, Standing Jewelry Box, Vintage Jewelry Chest, Retro Jewelry Organizer, Vintage Men’s Dresser Organizer, Jewelry Holder, Trinket Box, Keepsake Box, Treasure Box, Memory Box, Charm Box, or Special Gift, if you can’t find it here, it can be designed for you! My Bohemian Heart offers Custom, Personalized, OOAK Quality Hand Painted Vintage Jewelry Boxes for Men and Women. Whether it's an Antique Wooden Jewelry Box, Vintage Mens Valet Box, Standing Jewelry Box, Vintage Jewelry Chest, Retro Jewelry Organizer, Vintage Men’s Dresser Organizer, Jewelry Holder, Trinket Box, Keepsake Box, Treasure Box, Memory Box, Charm Box, or Special Gift, if you can’t find it here, it can be designed for you! I have never had such a great customer experience that I felt compelled enough to write a review for a product. I let the seller know that I needed the product quickly and it was in the hands of the mailman 90 minutes later! The item arrived a couple days later and looks amazing! The most perfect birthday gift for my wife. I wish I could leave more stars!! This is amazing!!!!! Delight your little Princess with a place to store her precious baubles! A once plain old jewelry box is transformed into an enchanting Shabby Chic Treasure Box! Painted and Ready To Ship Vintage Jewelry Boxes like this one are alway available... and always OOAK! For some, its music. For others, poetry. For me, it’s paint. Painting is my passion. It delights my spirit and fills my heart with happiness. Color is magical. It can take a neglected, unwanted piece of furniture and give it a new look, a new life, and even a new function. There’s nothing more rewarding to me than to take an old, forgotten furniture piece that’s lost its charm and transform it into something unique and exciting. When not painting, I’m thinking about painting. My husband and I enjoy traveling in our RV. When home, I paint and I teach painting, but when on the road, I’m always hunting for treasures to paint! I’m enchanted with vintage jewelry boxes. Jewelry boxes never go out of style, but some styles of boxes will never be made again and these are the ones I search for in antique malls and vintage shops. In my antiquing travels, I see gorgeous wooden jewelry boxes and valets practically begging to be restored. Intuitively, I know what they need. I select only quality pieces in exceptional condition. Sometimes there are what some would consider flaws, typical of many vintage and antique jewelry boxes, and at times, they cannot be corrected. If the wear serves to enhance the vintage feel and appearance of the jewelry box, then it comes home with me. Each jewelry box is welcomed to my smoke-free, pet-free studio where it is carefully cleaned and restored, aiming to preserve the original piece. Before cleaning, I completely disassemble each box, remove all hardware, and thoroughly clean the interior and exterior. If a lining is torn, I replace with either fabric or thick colored paper. And then enhance it…This is where the magic comes in: paint! Applying color is done by hand, using various shaped and sized brushes, and a variety of painting techniques. I use only quality paint and materials, such as Annie Sloan Chalk Paint Colors and Wise Owl Chalk Synthesis Colors. I blend and mix Custom Colors as well. I use various painting techniques to decorate each jewelry box; color tinted wax, glazing in any color desired, dry brushing, distressing which authentically gives the edges of a piece an older, more vintage look. Gilding waxes are sometimes used for highlighting and include gold, silver, copper, and pewter. Stenciling is often done, as is the French art of decoupage, which is pasting pretty papers, prints of vintage images, ephemera, and other materials to the jewelry box and then sealing it with a matte varnish to become part of the design. Each piece is finished and sealed with a top coat of wax, matte varnish, or hemp oil for durable protection. Almost always, a clear wax is used as a barrier to protect the jewelry box. Clear wax applied over the particular paints I use becomes one with the paint. Because the paints are porous, wax is absorbed as the paint and wax combine to create an incredibly hard and durable protective, though not waterproof, seal, which occurs during the bonding "curing" process. My wax is similar to the museum-quality wax used hundreds of years ago. It’s not only extremely protective, but creates a piece that can last for generations. Once all parts of the jewelry box are sealed, I allow it to sit undisturbed for three days. The stage insures your jewelry box is dried, sealed, and protected, though I recommend it remain undisturbed for a full 28 days after being sealed. It is very important to me that the jewelry boxes I restore can become heirloom pieces if their new owners decide to pass them on to loved ones. Preserving vintage jewelry boxes and seeing them given as gifts, to oneself or to others, fills my Bohemian heart with joy. Every single jewelry box I offer is a one-of-a-kind piece. No two will ever be alike. Custom creations are made to order using a jewelry box you select, as well as the colors, design, and style you desire. Victorian, shabby chic, contemporary… whatever you can wish for, I can create for you! These days, it’s trendy to “Reuse, Recycle, Repurpose”. For me, it’s always been a passion to Restore and Relove using paint. My Bohemian Heart offers an unlimited variety of vintage jewelry boxes for women, fine vintage jewelry storage for men, Trinket Boxes, Keepsake Boxes, Memory Boxes, Charm Boxes, even Treasure Boxes for little girls. Special items deserve special places, and special people deserve special things. Treat yourself, or another special person, to a beautifully restored, fine-quality, one-of-a-kind vintage jewelry box; the perfect place to keep special things that are close to your own heart. Yugonda Duffy is Bohemian by heritage and spends her day creating artistic designs after restoring vintage furniture and antique jewelry boxes. Beautifully hand-painted, each one a unique piece, Yugonda loves and encourages custom design work. My policy is simple and direct. Once your order has been delivered and you are happy I never look at your information again, It is stored in the Etsy database and would only come up again if you messaged me from a previous order or conversation. There are times when a guest purchaser does not use the conversation tool but I need more information to complete the order, I make several attempts to contact via Conversations but if the inquiry is not answered, I will then email. I do not save the email address nor do I have any mailing lists, I do not share the email with anyone, ever. The shipping label I print is an address that you have provided to me in order to send your package. This information is also stored in completed orders. To fulfill your order, you must provide me with certain information (which you authorized Etsy to provide to me), such as your name, email address, postal address, payment information, and the details of the product that you’re ordering. You may also choose to provide me with additional personal information (for a custom order of a jewelry box or valet or another type of piece if you contact me directly. How to Contact Me, you may contact me through Etsy conversations, click contact owner and this will open a dialog. Also at the bottom of your receipt is my email address, this is given only after a purchase and will not be revealed here. Due to the vintage nature of these one-of-a-kind pieces, the ability to be provided with photographs of any and all aspects of them before committing to purchase, and postal insurance being automatically provided when each jewelry box is shipped; returns, refunds, and exchanges are not accepted. Large Boxes are sent with FedEx Home Ground Delivery with a 5-7 day delivery estimate, not including weekends. Small Boxes with USPS Priority shipping estimates are 3-5 business days, not including weekends. Ready To Enjoy ~ Finished Jewelry Boxes ship the next day, Monday-Saturday, adding a monogram will add 1 day. *Possible Shipping Delays ~ During the winter months, weather can delay packages once they are mailed. I will keep you updated if I see a delay. All packages are shipped with USPS Priority Mail or FedEx Home Delivery and insured for $100.00. If your purchase is more than $100.00 including shipping, I will provide additional insurance. Each jewelry box is carefully wrapped with paper to protect its finish, clear plastic to secure drawers and doors, cardboard to protect edges, and bubble wrap to surround it. Your hand painted jewelry box is then gently placed and secured in a sturdy shipping box filled with packing air pockets and thick paper or Styrofoam peanuts. This is to insure that even if the shipping box is damaged in its travels, the piece inside should remain intact. Your piece is always wrapped in new material but I try to reuse clean shipping boxes when ever possible to do my part in recycling for a healthier Earth. Please notify me within 48 hrs. so I may file a claim for you. Please note that the shipping box and all contents must be photographed and saved for recovery of funds. The insurance company requires an email affidavit, the link is sent to you and must be turned into the etsyshipsurance company in order to receive item and shipping refund. I send insurance carrier all of the information/photographs/invoice for you. Without photographs of the package and the damaged item, the insurance carrier will not refund. Although I am not responsible for damage done in shipping by error, carelessness, or rough handling by postal workers, I will work with the insurance company, the carrier and you to rectify the situation ASAP. Calculated shipping charges are based on weight, total size in inches and destination zone. At this time only USPS has calculated shipping available to show you. I ship USPS or FedEx, whichever charge is the least after packaging. Smaller Boxes are usually less with USPS and larger boxes are less with FedEx. If your calculated shipping price is more than 2.00 savings with any carrier I will immediately refund the difference after purchasing shipping label. ***If you want to specifically have USPS or FedEx used, please send a note to me via convo, email or in the notes to seller during check out otherwise I will use the most cost-effective shipping method. Unauthorised coupon used for any purchased item will result in refund and cancellation of the order when no response is received in messages in regard to the purchase. Do the props in the photo come with my order? The items in the photos are my personal property used solely for the purpose of size identification or interest. They do not come with your purchased piece. If you see something that sparks your interest and would like to know where it was purchased I would be happy to share that information. I paint matching frames or mini jars upon request. 8 am to 8 pm Central time. Monday through Friday. Your messages and inquiries are important to me. I check messages on Saturday and Sunday but may not always be available to answer immediately, but certainly as soon as possible. Thank you.